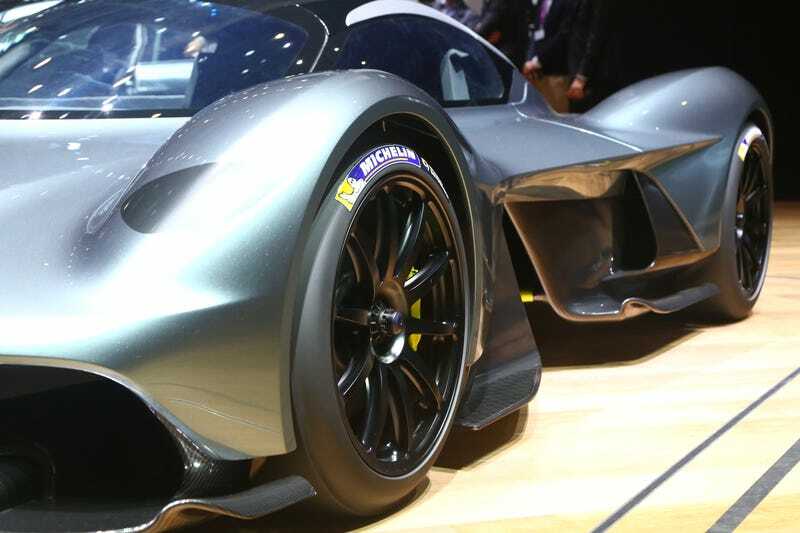 Hey, Normal Moneyed Guy—do you like the Aston Martin Valkyrie, but aren’t made of that much money? Like, you’ve just got a nice pile, but you’re not Scrooge McDuck or a Middle Eastern sheikh? Fortunately, Aston Martin has your back: the Valkyrie is the first of several planned mid-engine Astons, aimed squarely at regular old Ferrari and McLaren shoppers. Valkyrie is the start of a mid-engine dynasty, if you want to call it that. The reason we’re doing it is to create a halo car, but also to create DNA for a mid-engined sports-car range. Palmer didn’t specify what that range would look like, exactly, but with at least one more accessible mid-engine car on the way, it’s a safe bet that they’d like to poach a few folks away from buying a Lamborghini Huracán. Best of all, Car and Driver notes that the Red Bull Racing Formula One team will also be involved in the other mid-ship cars’ development. More icing on that cake: a V12 engine seems likely for the car, as Palmer said it was aimed squarely at the similarly 12-cylinder Ferrari F12 Berlinetta. Given Palmer’s fondness for manuals and American customers’ high number of requests for three pedals, there’s an outside chance that it could even come with a manual gearbox. Palmer also confirmed that the idea for a mid-engine car for the slightly moneyed masses is already in the design studio. That’s all you, Our Startup Is Doing Okay Bro and 2015 Powerball Winner Who Didn’t Squander It All On Ferraris And Coke! Aston’s current line-up still has to hit its sales targets the Regular Ordinary Mid-Engine Supercar to move forward into engineering and further development, but the idea is there. Palmer admitted to C/D they’re broadening their range slowly and carefully to rival not only the likes of the 918 and LaFerrari with the Valkyrie, but also the Bentayga and the Cayenne with the DBX.